Sterilite storage bins and Sterilite storage totes are the larger line of storage from Sterilite. They feature large sizes, built-in handles and snap-on lids. The Sterilite bins come in various colors so you can color code your organization in the attic, garage or other room you want to store lots of items in. They even come in festive holiday/seasonal colors that change every year. Many of the Sterilite plastic bins are stackable so you can maximize storage space. 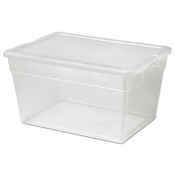 Sterilite storage bins may also be referred to as Sterilite totes. Store large items or lots of items in Sterilite storage totes - the built-in handles allow for easy toting despite the large size. 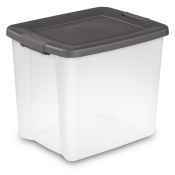 Sterilite bins are commonly used to store clothing and decorations in attics, garages and even basements. If you're looking for a particular size or color of Sterilite totes, give us a call.